Watch the interview preview on EWTN here Courtesy of EWTN Global Catholic Network. The opening prayer or collect has received little notice in the reform of the liturgy, although the scholarship behind it is as solid as its tradition is broad and profound. This brief prayer beguiles with brevity and apparent simplicity, and we too easily shy away from the rewarding harvest of encountering this prayer in its mature abundance and gleaning the fruit in its proclamation. The length of an average opening prayer is four short lines, recited in about ten seconds. If we want the assembly to make the prayer its own, then more time and attention must be given to its effective proclamation. I have found that understanding the literary structure of the prayer is helpful, so that as the prayer unfolds the assembly may make the prayer its own in the hearing. 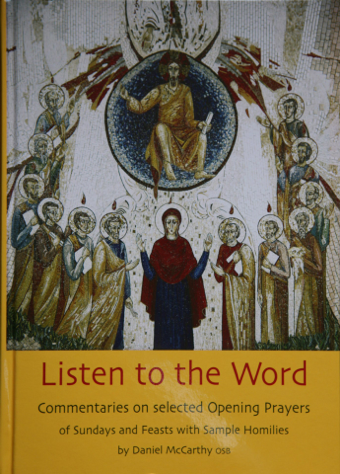 This book offers a thorough revision of the commentaries first presented in The Tablet from March 2006 – September 2007. The translations have been submitted to the review of Rev. Reginald Foster. The book has been augmented with images from the ambo of Santa Sabina, Rome, with explanations. To limit preaching and reflection to the scriptures omits the Church’s response to the scriptures preserved in these short prayers as much as 1,600 years old. Including the prayers in preaching and reflection further inspires our response to the scriptures. Visit the Monastery Gift Shop in person. We accept Mastercard and Visa. Fr Daniel P. McCarthy OSB, is a monk of St Benedict’s Abbey, Atchison, Kansas. Having just completed his doctorate at the Pontifical Institute of Liturgy, he now teaches and writes in Rome. He is the author of two series of weekly commentaries published in The Tablet, one on the collects (2006-2007), the other on the prayers over the gifts (2007-2008). He is co-director of the DREI project and co-editor of the series Liturgiam Aestimare : Appreciating the Liturgy. Fr James G. Leachman OSB is a monk of St Benedict’s Abbey, Ealing, London, who teaches and writes at the Pontifical Institute of Liturgy, Rome. He is assistant editor of Ecclesia Orans, co-director of the DREI project and co-editor of the series Liturgiam Aestimare : Appreciating the Liturgy. He writes on the Liturgy of the Church of England and the theology of Rite of Christian Initiation of Adults. He edited the volume The Liturgical Subject: Subject, Subjectivity and the Human Person in Contemporary Liturgical Discussion and Critique. Richard Yeo, “Review of Book”, Downside Review 127 (2009) 303-304 (download here). Kevin McGinnell, “Book review”, Anaphora 4 (2010) 71-73. Paul Turner, “Book review”, Pastoral Liturgy 41:5 (September – October 2010) 18. Guerric De Bona, “Book review”, American Benedictine Review 61:2 (June 2010) 210-212. Ashley Beck, “Book review”, New Diaconal Review 2 (May 2009) 48. The European Society for Catholic Theology, ET Newsletter (13 July 2009). William C. Graham, Celebration: A Comprehensive Worship Resource 38:8 (August 2009) 5. Bosco Peters gives this first review of the book. Tony Doherty, “Take a bow”, Letters to the Editor, The Tablet (3 December 2011) 18. Christopher Howse, “Sacred Mysteries”, The Telegraph (17 February 2017) available here. Anne McGowan, “Collecting Connections: Praying, Believing, and Living”, New Theology Review 29.1 (September 2016) 49-52 available here (numerous references to these articles).